Martin Šútovec, also called as Shooty is graphic designer mainly known as cartoonist and critic. His domain is mainly political and social critic in which he humorously and cleverly reacts on current situations. His cartoons are characteristic for it‘s visual language. They are understandable, uncompromising but not superficial. Because of this, people like Shooty, and his cartoons gained recognition in society. Politics is happening and cartoons are daily published at daily paper, and gradually Shooty's cartoons became part of ordinary day for lot of people. This cycle was interrupted by events which overwhelmed even the strongest slovaks. Murder of investigative journalist and his fiance shocked whole country. From the beginning of this case strange things were happening, and many other came to the surface later. 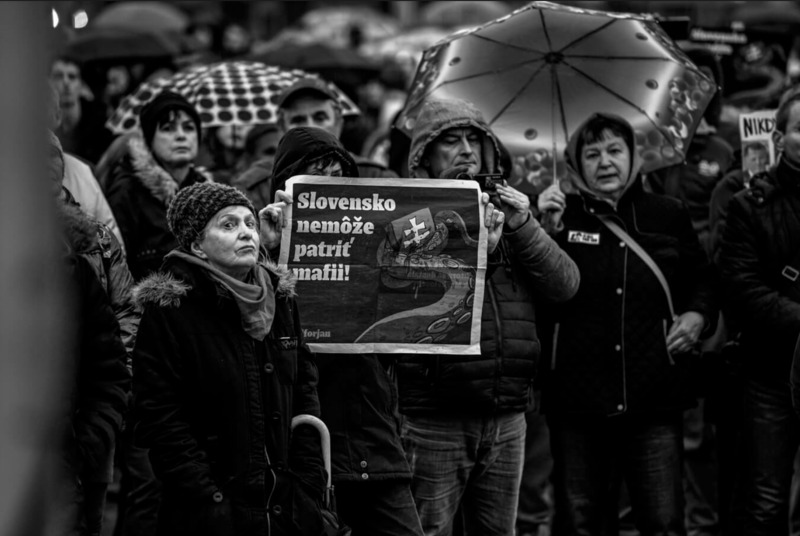 Part of slovak politicians were connected with italian mafia – it‘s tentacles were reaching into the highest politics. Shooty reacted immediately on this events, obviously with cartoon. One which we can consider iconic became poster. On this cartoon is clearly visible how Shooty adapts on different situations and still preserves his visual language. Cartoon „Slovensko nemôže patriť mafii!“ is different from other Shooty‘s cartoons, different in visuality and even in content. Cartoon is reacting on negative events which reflects in dark, shady visual. National emblem squeezed by tentacle is clearly pointing on what is happening and is main element of poster. This element is accompanied with message which became the name of this cartoon. Clear message and symbolism gave this cartoon/poster great premise to become popular among people – and it really happened. Many people adopted message of this cartoon, and because of it, most of them could express their opinion at the demonstrations. I think Shootys reaction was perfectly managed. It was not ordinary cartoon, it was different from others even by its visuality, but it retain its characteristic style. Its goal was not just to criticise but to create „object“ or message to bond people together and give them something to express their opinion. And we could see a lot of Shootys posters out there, and a lot of people shouting that message at the square.